A misshapen head is often a sign of plagiocephaly. Is the right side of the back of their head flat? Is their right ear pushed forward a bit? If so, then they could have positional plagiocephaly. Laying in one position too long can exert a lot of force on a baby's head and cause them to develop positional plagiocephaly and for their head to become asymmetrical. Since the recommendations for sleep positions changed and infants began being put to sleep on their back, this problem has greatly increased. The benefit of a lower risk of SIDS still makes putting babies to sleep on their back very important, though. 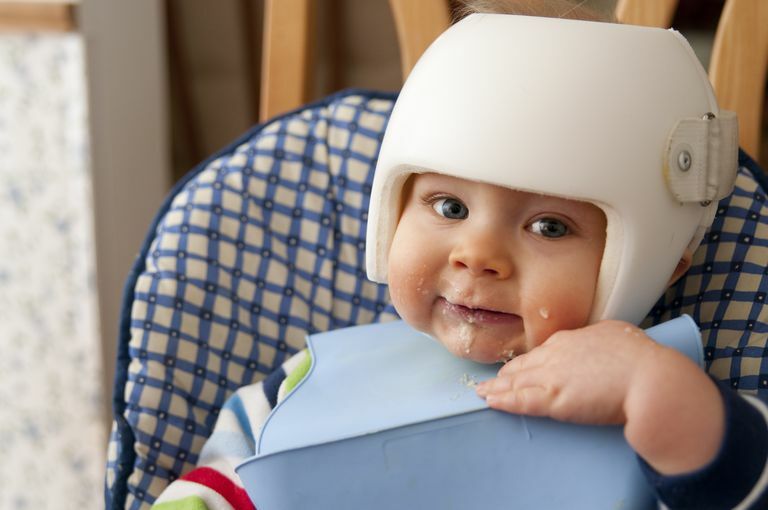 Infants can also be at risk for positional plagiocephaly if they lay in a car seat, bouncy seat, or swing too long. Alternatives, like a wrap, sling, or carrier, usually put less pressure on the back of a child's head and can be helpful to prevent a baby from getting a flat head. Although many infants develop positional plagiocephaly because they simply prefer to lie in one position all of the time, others have this problem because they have limited neck motion and can't help laying in the same position. These children with congenital torticollis have limited motion on one side of their neck and may have a hard mass on their neck muscle. See our guide to positional plagiocephaly for more tips and advice on helping your baby grow out of positional plagiocephaly. Keep in mind that some infants do need treatment and don't improve just with making positional changes. And see your pediatrician to confirm the diagnosis and to make sure that there isn't a different problem causing his head to be shaped this way. Other conditions that can cause an infant's head to be misshapen include craniosynostosis. Infants with coronal synostosis, in which the coronal sutures of the skull fuse early, can get a flattening of one side of their forehead and a compensatory bulging of the forehead on the other side. The back of these infant's heads should appear normal though and not flat or misshapen at all. Another form of craniosynostosis, in which the lambdoidal suture closes early can cause a flattening of one side of the back of an infant's head and bulging of the forehead on the opposite side of their head. This is in contrast to what happens in positional plagiocephaly, in which the flat side and bulging side are both on the same side of the infant's head. Keep in mind that this form of craniosynostosis is very rare. Sagittal craniosynostosis or scaphocephaly is another type of craniosynostosis in which children will have a long, thin skull that is wider in the front. Lastly, children can have trigonocephaly or metopic craniosynostosis, with a triangular shaped forehead. Consider seeing a craniofacial specialist if you aren't sure if your child has positional plagiocephaly or craniosynostosis.